As we reflect on the importance of gratitude this month, we have rehearsal dinners and the special purpose behind them on the mind. Not just for going over what happens at the ceremony the next day, it's the perfect way to express your thanks to your closest loved ones for their love, support, and involvement in making your wedding day become a reality. Smaller and more intimate than a wedding reception, you can do a lot more to personalize your rehearsal dinner no matter your budget! 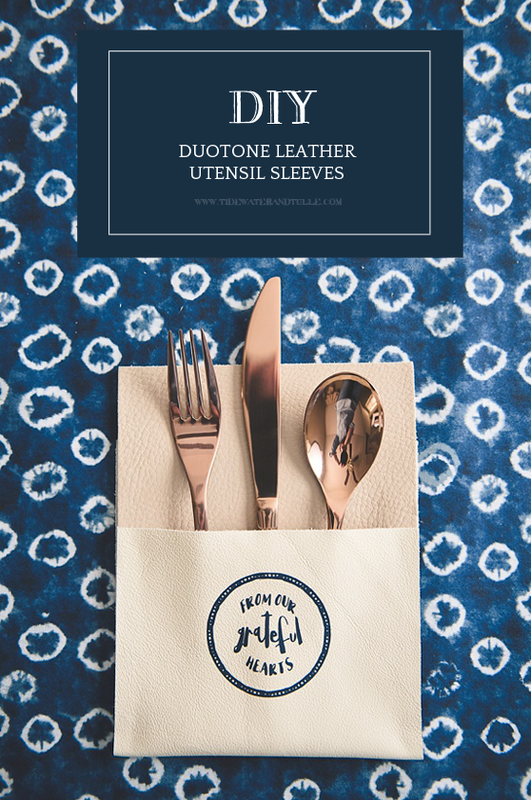 Inspired by upcycling leather scraps, we have created a gorgeous way to "say thanks" for your place settings with these DIY duotone leather utensil sleeves. They're no sew and so easy to make that you'll want to reuse them again for Thanksgiving! 1. Lay out all of your materials. We'll first start with the leather. 2. 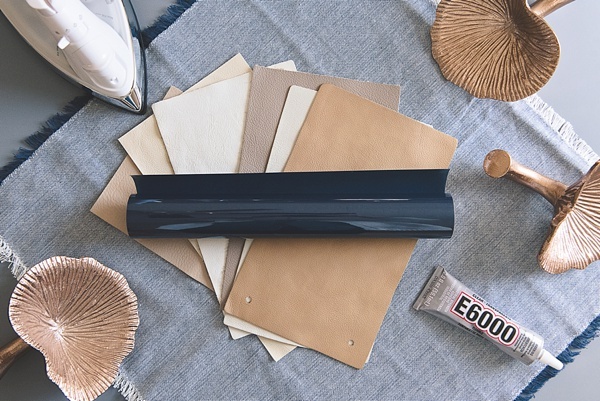 Since leather scraps can vary in size and shape, trim, cut, remove labels, or size down to your preferred size and arrange in preferred color theme. It doesn't matter if they are different in length size as long as the widths are the same. I recommend using a set of flatware to determine how long you want your folded utensil sleeves before any cutting or gluing happens! 3. Use a marker to make one dot on each edge where the base leather color will need to be glued to the "pocket-to-be" leather. To protect your table, put pieces of cardboard underneath your leather before doing any gluing. On the bottom "pocket-to-be" leather color (on the rough side), use your craft glue to create a square and an X on the inside. Place your base leather piece (smooth side up) on top of this glue shape and smooth out. 4. 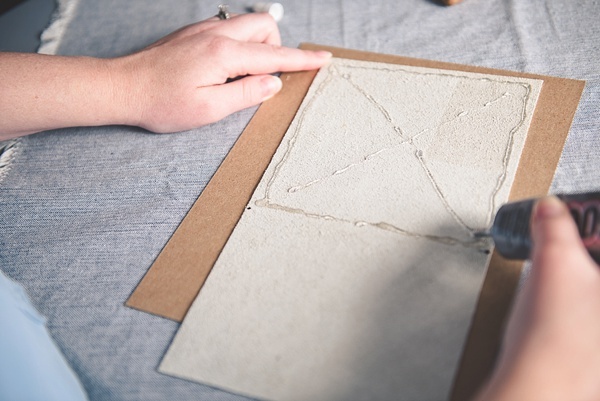 On the "pocket-to-be" leather, draw one glue line on the left side and then on the right side. Be sure not to put glue on the top and bottom! You've got to be able to put your flatware in there! 5. Carefully fold the bottom leather, create the pocket, and press down to the base leather. The E-6000 craft glue needs at least 24 hours to "cement" (aka cure) materials together, so place weighted objects on top of your utensil sleeves overnight. 6. 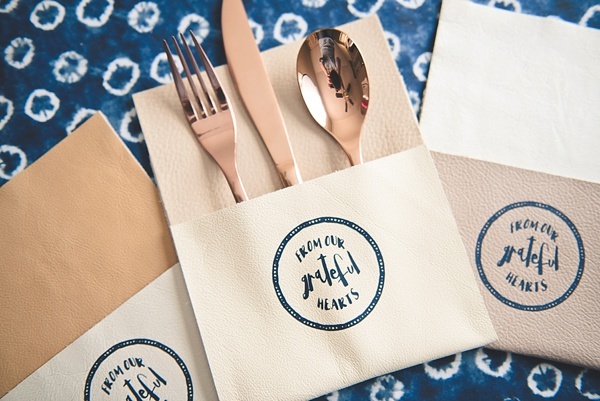 After your utensil sleeves are ready to be personalized, download our FROM OUR GRATEFUL HEARTS graphic and upload into your personal electronic cutting machine software (I used my favorite and preferred Cricut Design Space for my iron-on decals!) and set up your iron-on material on the adhesive grip mat. Size your graphic between 3" to 4" wide depending on your leather scrap size. 7. After you weed out the negative space on your freshly cut graphic, leaving only the words and circle, preheat your iron to the highest setting (such as Cotton) and set up your ironing board. 8. 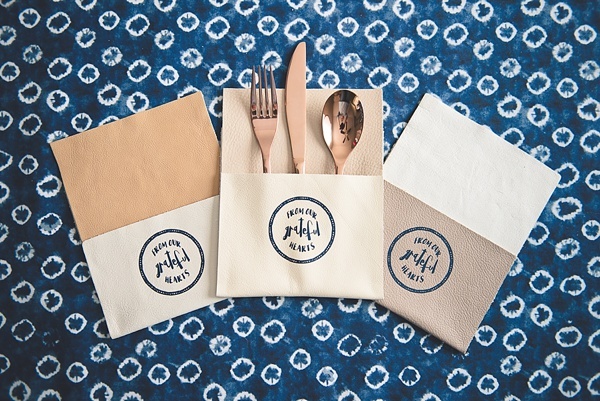 Place your cut graphic (shiny liner side-up) in the center of your utensil sleeve's pocket. Using the iron, press down over the shiny liner two or three times. 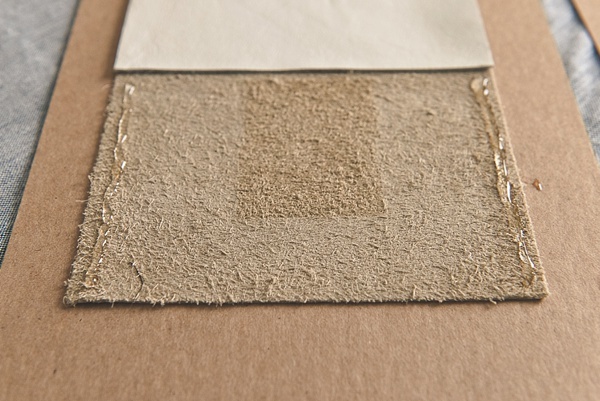 Carefully lift the shiny liner to see if the iron-on material has transferred onto the leather. If it has not, replace the shiny liner and continue to apply heat to that area until the iron-on material removes itself cleanly and completely from the liner. 9. 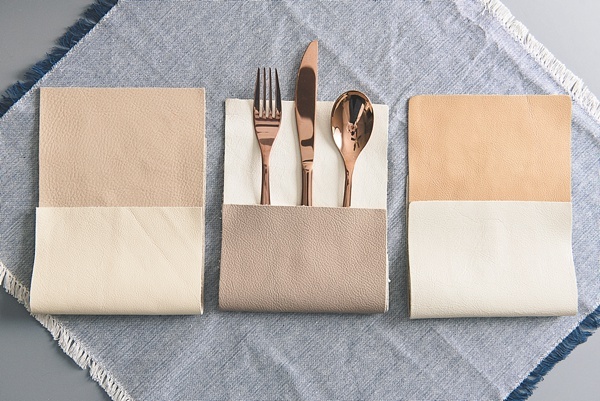 Let the leather cool and then place your flatware inside the pocket to see your thoughtful detail all finished! 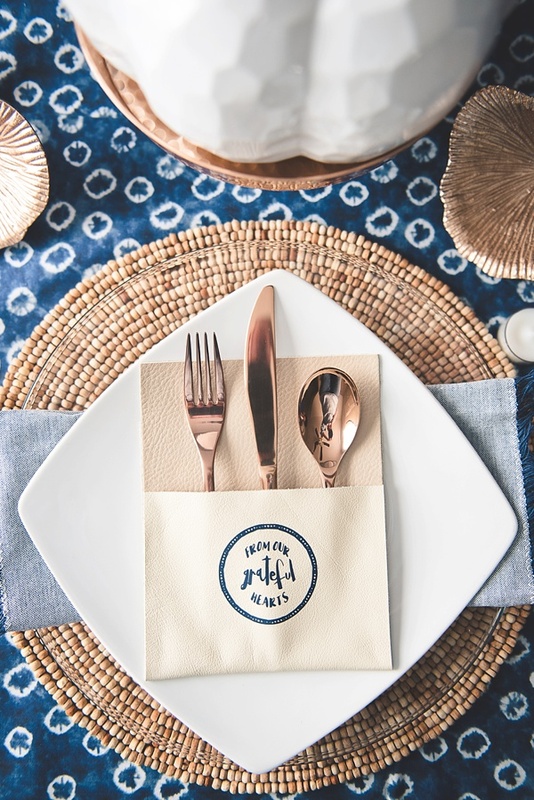 For any kind of rehearsal dinner, it's all about the experience, and you can make that experience special by personalizing little details and setting a thoughtful table. Since I'm a must-have-more-than-one-purpose kind of person, consider using a non-traditional color palette with autumnal metallics like copper or rose gold. 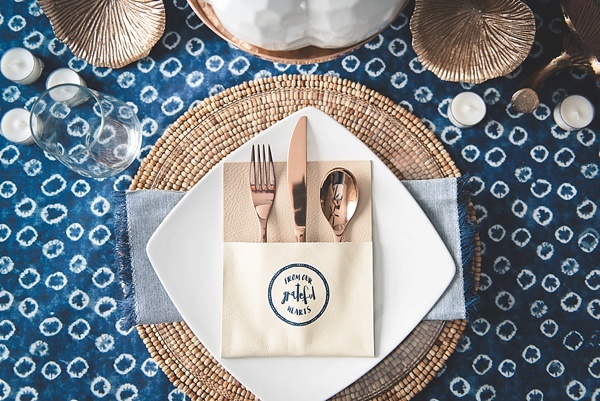 By pairing the warm metallic with dark blue and contrasting white, it really helps set a beautiful tablescape... and most likely you might already have a ton of decor options around your house! 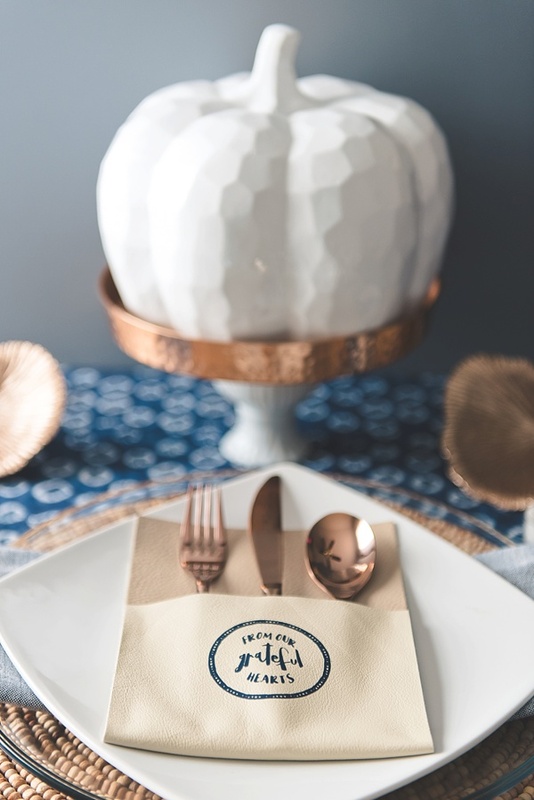 Instead of turkeys and cornucopias, you can still bring in those festive textures through your chargers and centerpiece details like bold geometric pumpkins and fun copper mushroom figures. Modern shapes and design elements help you bring a fresh spin on a traditional favorite! Some of the above product links are affiliate-linked and purchasing through these links helps support our wonderful sponsors and Tidewater and Tulle! You can find our full affiliate disclosure policy here.